Preparing For Our Children's Future: ~Stonyfield Oikos Organic Yogurt~ Review & Giveaway! 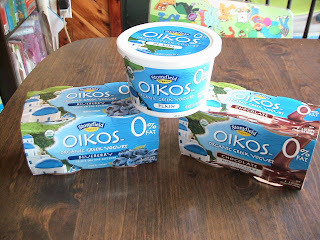 ~Stonyfield Oikos Organic Yogurt~ Review & Giveaway! When I started planning this "Spring Into Health" blog event, I wanted to share some great products that are healthy and promote good health. So when I was introduced to Stonyfield and their great products, I was very excited to try them! I Love yogurt and I love it for a snack for my children! But before now I hardly ever bought it, since my local grocer only carries non-organic brands. As you can imagine, I was delighted to find Stonyfield's Oikos at our Wal-Mart! I like Stonyfields products because they have the great live active cultures that make yogurt so beneficial to your diet. enhance the activity of natural killer cells—key components of the immune system that are known to decrease as we grow older. Our Oikos Organic Greek yogurt contains five live active cultures." Want to see how they make their yogurt? Visit this link for a great video! Stonyfield has a great line of YoBaby yogurt, meals, drinkables, and Yokids yogurt and squeezers! Plus a line of fat free yogurt, frozen yogurt, ice cream, smoothies, o'soy, etc!!!! Check out their great line of products HERE! To buy their products, visit Stonyfield to find the closet store near you that carries Stonyfield products, or check at your local supermarket, Wal-Mart or Natural Foods store. 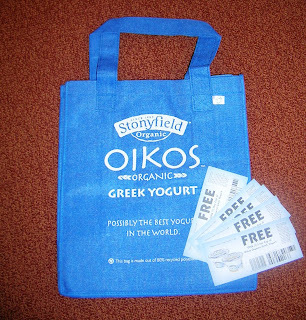 The great people at Stonyfield are giving one of my readers an Oikos tote bag, 4 free 5.3 oz coupons and 1 free 16 oz coupon! Visit Stonyfield and tell me which products you want to try. This giveaway is open to US ONLY and Ends on April 30th at 12 am central. The winner will be chosen at random using random.org. The prize will be sent from Stonyfield, directly to the winner. For purposes of this review, I received some free coupons from Stonyfield. I'd like to try their vanilla yogurt. I'd love to try their strawberry pomegranate flavored yogurt! I learned that they give 10% of their profits to efforts that help to protect and restore the earth! I want to try the Greek Style Honey yogurt. I want to eat it and try baking bread with it. I think the strawberry pomegranate flavor would be delicious! Thanks for the giveaway! I have tried many of thier products. We love the YoBaby yogurt. I need to try the squeezers. Greek style yogurt is my fav. i'd like to try the raspberry smoothie. I'm a huge fan of Stonyfield and have been wanting to try Oikos. I would like to try the Blueberry Oikos and Honey Oikos. From their site - you can sign up for their rewards program and earn eco-friendly things! I'd try the chocolate underground! Now a fan of Stonyfield on Facebook. I would love to try their strawberry banana smoothies. I learned that probiotics can even help clear up a baby's eczema, via the stonyfield website. i love their yogurt - but i just saw on their website they also have ice cream. I like to try the After Dark Chocolate flavor! i now follow your blog with blogger. What a fantastic giveaway...I love Stonyfield Products. I would like to try their milk. I am a fan of Stonyfield on Facebook. I am a new follower and am glad that I found your blog! I entered the Green Mountain giveaway..yum! I entered the StraightStitch giveaway. I learned about cooking with yogurt from the website. on the stonyfield site, I found a recipe for a tropical fruit smoothie- sounds SO good!! I'd love to try their Creme Caramel ice cream! I didn't know they even made ice cream! I'm now a FB fan of Stoneyfield! I would llove for my kids to try the YoKids squeezers. i learned that there is a HUGE difference between "natural" & "organic"
Natural doesn't have a set, strictly defined or regulated definition. and Organic does. Organic means growing without the use of an toxic pesticides or GMOS.